I tested the output of the new XP-L led (XP-L V6 2C tint, from illumn.com) compared to a XM-L2 I had in the spare leds box (XM-L2 T6 3C, from Fasttech). Both were mounted on a 20mm copper Sinkpad, the XP-L on a xp-type and XM-L2 on a xm-type. The introduction to this test is a bit longer than usual, to explain the altered method, up to now I did ceiling bounce light measurements, from now on I will use an integrating sphere. I built the sphere a while ago, and after quite some testing and characterisation I am confident now to use it for measuring led output. The integrating properties of the sphere proved very good, I solved the serious variation caused by the relative big measurement hole (by building an adjustment light into the sphere), I solved why I got inconsistent readings from the sphere (a moving piece of tape ), and now I think it really works, so from now on I will use the sphere for flashlight/emitter tests (if only because the measuring has become easier and more comfortable:I can do the tests sitting on a chair at the table now ). Further reading about me building the sphere can be done here, although I still have to update the OP of that thread with how the integrating sphere was corrected and characterised. So it is only 17 mV at 5A current (0.017 V), that is pretty low IMO, for the graph numbers I will not substract that from the measured values. Whoever wants the voltage at the ledboard solder joint can easily calculate it (so that is a drop of 3.4mV/A), but in that case: you are probably also bothered with the voltage drop over the board traces, Relic38 showed to us that that is also not negligible . There is a magic conversion factor that I came up with, to convert the uncalibrated integrating sphere readings to lumen, it is 1.58. It is an estimated number, it came out of 'calibrating' the sphere with several flashlights with 'known' outputs, and previous measurements of leds using the ceiling bounce methods. 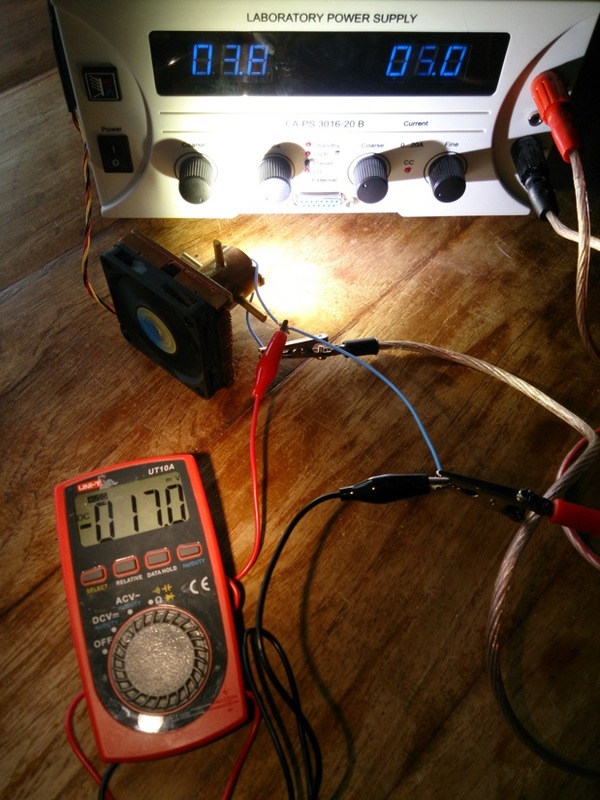 It came pretty close to the official output of the high setting of my Sunwayman D40A: 550lm, so I decided to define the output on high of my D40A to be the official 550 lumen, the resulting conversion factor was 1.58. There is of course an annoying uncertainty in this number (and every D40A will be a bit different), it will not be way incorrect, but it can easily be 7 or 8% off the real value. To get that percentage down, I could use many more flashlights with official but still uncertain outputs, but the best way is to have a constant light source measured in another, calibrated sphere (and that will cost me 340 euro's and that is not going to happen). So 1.58 will be the conversion factor for at least the coming period. 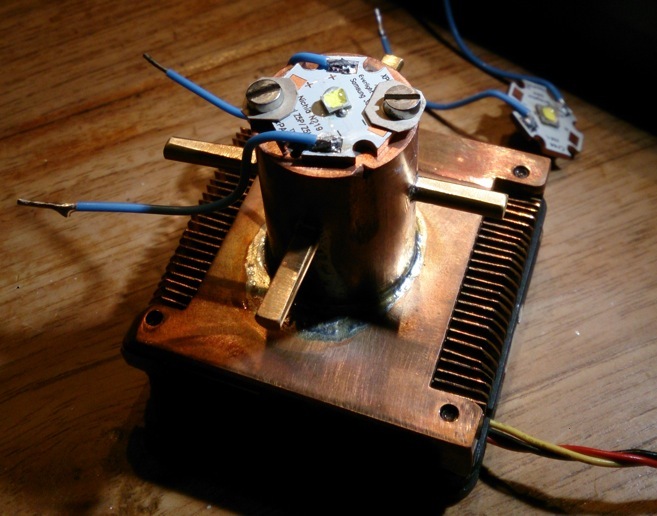 The XM-L2 T6 bare led output was measured before, by match. He measured it lower than I have here, about 7% lower. The calibration of his sphere was done the same way as I did now, using flashlights with known outputs that vary per unit, so I see no reason to adapt my calibration to his, also because the T6-bin is not exact, the emitters we tested could be at two ends of the T6 bin spectrum. (Texaspyro used home led lightbulbs for calibration because there's multiple leds in them, averaging out the differences between them, that could be a bit more accurate but is still not exact). 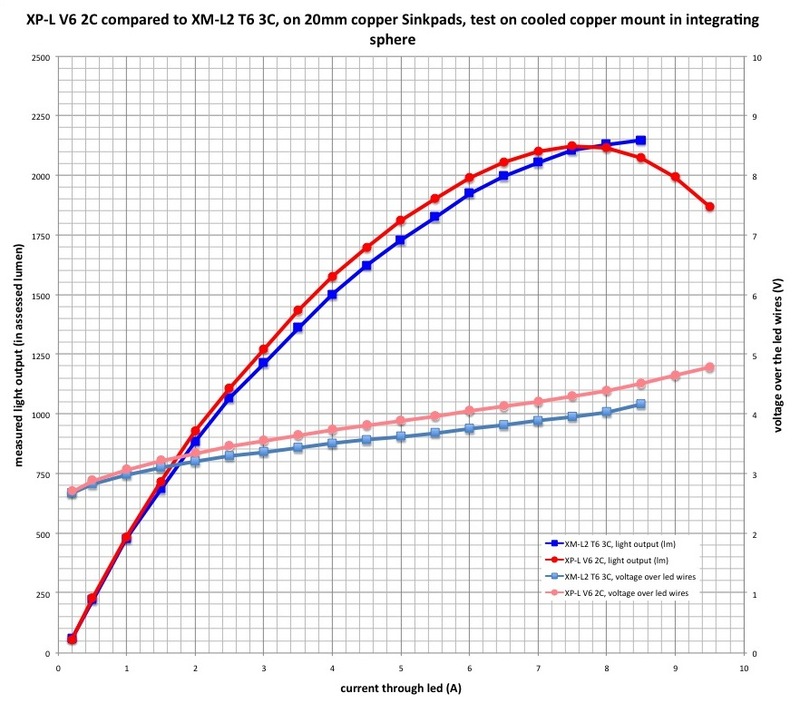 On to the tests: XP-L compared to the XM-L2 ! I first tested the XM-L2 up to 8.5A (the XM-L2 in my crashtest last year blew at that current, I am lucky with this one ) . I did not go higher now because I still want to use the led (those XM-L2's do not come cheap). I measured by starting at low current and turning it up half an amp everytime, slowly, no rush. Although I did not let the output fully settle after each current increase, the output drop was so slow that in the graph you would not see the difference if I used fully settled outputs. To illustrate this: at 8.5A the measured output after 20 seconds was 2149 lumen, I let the output settle, and after 3 minutes it settled at 2127 lumen. 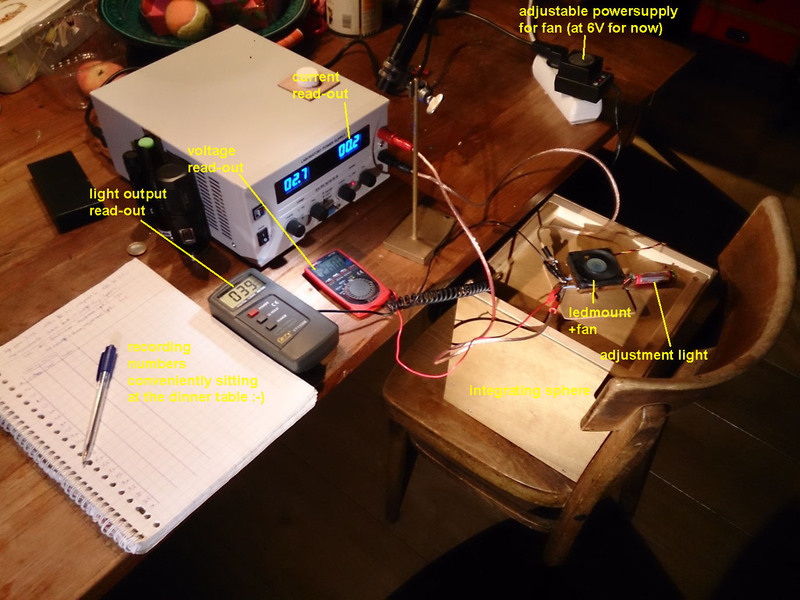 The results match reasonably with what I measured last year, but the voltages are measured better (lower) now because last year I measured it using the (not so good, switching-mode) power supply voltage reading, not with a separate DMM close to the led. What striked was that the output was not that much higher than the XM-L2 T6, it had a clear maximum at 7.5A. and that the Vf is considerably higher than the XM-L2: as much as 0.3V at 6A current. There is of course a variance between different specimens of equally spec'ed leds but I think these differences are too significant for that. The more measurements I do, the less certain I am if what I am measuring is true (Confucius? ). So I hope they make sense and are useful, I appreciate feedback if my numbers are at all in line with other experiences with this led. Thanks for reading! You have a link to a supplier of these new XP-L emitters ? Great Tests! Just want to be sure - it's the V6, not the V5 XP-L? The graphs say V6 but the title and opening says V5. Actually both are available in a 2C tint from Illum, and I hope it's a V5. The higher Vf makes sense, according to the CREE specs, but should still be lower than the XP-G2's. Also, peeking at 7.5A makes sense (I think) because of the smaller mount, maybe? Nice setup djozz and thanks for all the testing. I always use reference threads like these especially for voltages at different currents. Incredible job djozz! Your crash-test threads are always so informative. XP-L and XM-L2 both have the exact same die size (2mm x 2mm) right? Whoa, this has to be the most accurate, disciplined emitter testing ever done by a "hobbist". I bet if the engineers a Cree see this, they will be saying, "why didn't we think of that on a couple points. I am not near anything like your level, but I agree about not needing to adjust to Match's (another great maverick) numbers. The T6 designation was used for everything at the time. Some vendors now keep good track of the chain of custody, which is such a great improvement. The more measurements I do, the less certain I am if what I am measuring is true (Confucius? ). So I hope they make sense and are useful, . . . I can only imagine that the more precise you get, the more you are aware of more little potential error inducing issues. All I can say, is that no one that I'm aware of, has ever implemented such disciplined, diligent emitter output testing. Correct (most likely) or not, it is the best we have here at BLF and probably any other forum by far. Thank you. Given the smaller footprint, I say your results are impressive on the side of the XP-L. Thanks for the testing, it is a great resource! I am very disappointing with the XP-L, i expected a much stronger showing especially below 1.5A. If you used an XM-L2 U2 i can imagine them being neck and neck, in fact it may start out at a higher lumens then the XP-L which makes no sense because the XP-L is supposed to have 200 lumens at 1W instead of approximately 140 lumens. 200 lumens per watt, compared to a XM-L2 U2 under the same conditions does something like 194 lumens per watt. Unremarkable. Cree's very own 'Product Characterization Tool' thingie. Awesome…shows the XP-L is slightly outperforming the XM-L2…wow! So much light in a teeny little footprint…how sweet it that! of it's lower vf - meaning that a Liion for power the XM-L2 will produce full brightness for longer as the voltage drops, especially at high amps. Riding for 50 years, last off was black ice in ’73. First paid computer job was in ’75, writing an extra report for HAPAS accounts on a Wang Computer. The XP-L does have a higher lumen output but at a higher Vf. That is a big obstacle when trying to direct drive these LED’s. Thanks for the tests djozz! Do they? As I read some unofficial information both XP-L and XM-L2 have the same die size (2mm x 2mm). Now who can help to confirm this? The data sheet found in CREE website doesn’t specify this. Die size is the same as XM-L2. So it wont throw better than XM-L2. This will be future reference data. Like Tom E said, we need to know if you tested V5 or V6. My first impression when looking at these numbers are that Im not impressed with the XP-L. I expected it to be better. If you tested V6, then Im certainly not impressed based on the graph. There are pics in the other XP-L thread of a dedomed XP-L and a dedomed XM-L2 and they are clearly both using the same die. It is a XM-L2 die stuck onto a 3.5x3.5 XP-sized substrate. oops, that was a bit of sloppyness on my side, sorry about that, it is very important to mention the right bin and I made a mistake: I looked up the order confirmation from illumn.com and it was indeed a V6 bin that I ordered. So that leaves you all even less impressed . I corrected the OP! Thanks to you all for the appreciation of the tests. I have one of these emitters leftover, it was next to the tested one in the same piece of reel. Out of curiousity, one of these days I will do an exact as possible same test on that one (but up to 8 amps, I don't want to loose this one) to see how consistant the results will be. Of course if the results do not exactly match I will never know if it is a difference in the emitter or an inconsistancy in the testing, but undoubtedly it will give some insight in something . I wouldn’t call it an improvement so much as a variation and we like variety. Now you can more easily use an XP-L die on a 10mm sink pad with more room for wires and optic. The drop off at high current is unsurprising given the smaller center pad. What is surprising is it’s ability to run even with the larger footprint XM-L2 as long as it does. That might be due to the size of the heat sink though. The next issue will be getting small optics that fit the larger dome. Even with XP or Nichias a 10-15mm optic doesn’t focus too well. 3)put in a wavelength analysing device. Texaspyro put some rgb sensors in his sphere and can measure colour temperatures and other interesting things going on with colour balance, pretty cool, but what you really want is a spectrofotometer with a handy sensor that you can stick into the sphere and that can produce true wavelength spectrums, so you can do colour analysing from that . 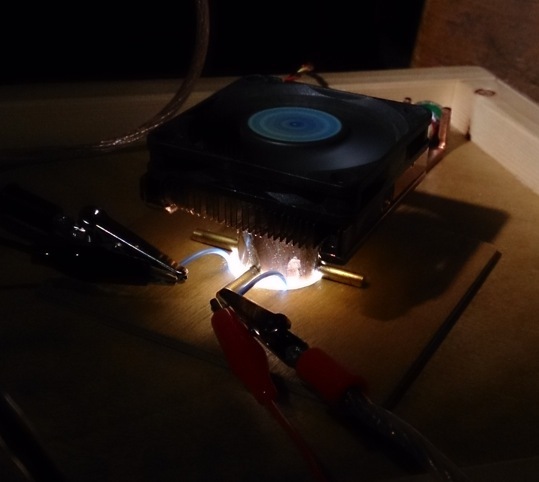 4) (and that is something I could do sometime) add a temperature sensor somewhere close to the led (relic38 did that during his copper board comparisons) and see what is happening there despite of the maximum cooling that I tried to achieve. This may be a big flop, but I really want to try to use 2 XP-L's in a TeePee or "V" formation. Hoping it will give a bigger hotspot than an XML, but more intense than and MT-G2 (and hopefully than xml too). The TeePee or "V" formation will help bring the 2 emitter's dies closer together. It well also aim the most intense portion of the emitted light at the reflector (which is were most throw comes from). The positive contact pad of one will be in contact of the negative contact of the other for a 2S electrical formation. Might be able to file off small bit of the substrate edge to bring them ever closer together. It might also have a some what elliptical beam pattern, which is a bonus for me as we see wider horizontally than vertically. It would be neat if you used your remaining emitter to do a dedome test. Just cross posted with your Post 27 djozz. Those do indeed sound like sweet upgrades. Money and time constraints, they are a bummer, but do make us more creative. Thanks for the test. These results are significant, at least if you agree that different bins are significant, which I do. Hopefully the price comes down and these continue to be remain available. I'm going to try getting these into a lantern this week and go up from 125 lux with a XM-L2 T6 and stock Noctigon up to 500 lux with 3x XP-L V6 and a BLFDD driver. Unfortunately max output will quickly drop off because the battery and thermal mass is small, but it'll be fun for a few seconds.